Our Large is OUT OF STOCK, but we have ordered more! You are still able to purchase it now and we will ship it to you as soon as it arrives. Questions? Please call 1-800-438-5346 or email us at info@Lehmans.com. These socks don't mess around: they're made for bone-chilling days and frigid nights (20F and below). 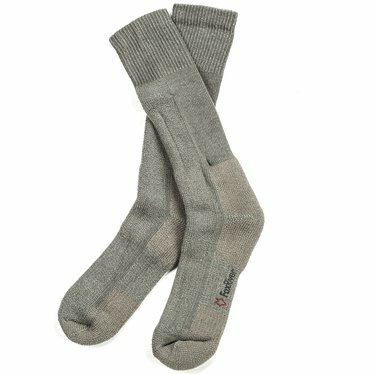 Soft, heavyweight Merino wool blend wicks away moisture to keep your feet dry and comfortable. Secure fit means no bunching in the bottom of your boots. Cushioned shin provides extra padding against boot laces. Full Merino wool cap over toes gives you extra warmth where it's needed most. Yarn is embedded with AlphaSan, an odor-resistant silver agent. 50% Merino wool, 32% recycled polyester, 13% nylon, 3% polyester, 2% spandex. Fits women's shoe sizes 7 to 9-1/2 and men's 6 to 8-1/2. Fits women's shoe sizes 10 to 12-1/2 and men's 9 to 11-1/2. Fits men's shoe sizes 12 to 14-1/2. I love these socks! I'm in the Army and wear them every day with boots. They are super-comfy, stretchy and warm. I couldn't be happier with this purchase! These socks are great! Not only do they keep my feet warm, which are always cold, but they are very soft and cushiony too! I bought 4 pair in the color green. Best money I've spent on sox EVER.